In today's technology-driven market, business owners must continuously step up to the plate and embrace new retailing models. If I asked if you know who your customers are, you would probably say, "Sure I do, I help them with their pets daily, or at least weekly." But in just a few years there will be a new market place. Right now many of your customers — possibly most — are people heading into retirement age. There are some pretty young people too, but not as many in the mid-level age group of 25 to 40. The customers you cater to today will not be the same as the customers you need to attract tomorrow. There are huge shifts taking place in the population that will affect pet-keeping habits. The emerging market forces are drastic and range across ethnicity, age and new lifestyle preferences. These forces are already beginning to play an important role in the types of customers that will become the cornerstone of every pet business. There are three primary market forces that affect all pet businesses: the customer, what they buy and how they buy. These three elements have always been part of the equation for a successful business. However they are changing significantly throughout the business world, the likes of which we have not seen before. The entire way of doing business is being impacted as well, with widespread use of the Internet, changes in lifestyles and fluctuating demographics in almost every neighborhood. No matter where you're located, these changes should be understood and responded to. They are primary market forces that will need to be incorporated into the business plan of every marketing entity, large and small. My October WPA article, Follow industry trends: Grow the most successful pet business explores in-depth, the changing types of pet owners by age and demographics, as well as other consumer trends. Keeping your eye on the ball, now and into the future is absolutely necessary for the continued pet business success. To be a strong competitor and prosper, you must determine exactly who your particular pet customers are, what they are buying and how they are buying. Customers are changing due to age. Today the largest customer groups owning pets is between about 50 to 65 years old. This aging group still loves their companion animals, but the strength needed to keep larger animals is less, so they are trending towards small pets. Yet as these people age, there will be a significant reduction in the number of pet owners. The next group, between about 25-40 years old, is an even larger group of people, but not as heavily pet-oriented. They are more frugal with tighter budgets, so tend to own fewer pets. Consequently, as they replace the older age group, there will be a retraction in the overall purchasing of pet supplies and services. The number of pets owned increases again in youngest group, teens up to about 24 years of age. This group is keenly interested in pets as companion animals, however they have less income than the other two groups. Customers are changing due to demographics. Throughout the next 10 years and beyond, there will be a major shift in population. Barrie Dawson, in his article The Changing Face of Pet Ownership, states that "by 2038, demographers say, more than half of the people living in the U.S. will be nonwhite or Hispanic." Hispanics, currently comprising about 20 percent of the population, will reach around 30 percent in a generation. Asians and other minorities are becoming more prominent as well. Evolving changes in ethnicities are already beginning to impact what businesses need to do to attract these new types of customers to their products and services. Changes in pet owner habits. It is important to know what you customers are buying now and what they will need over time. As mentioned above, the two most prominent pet-keeping groups are the customers currently between 50 to 65 years of age and the younger people. The older group will respond well to businesses that make their pet keeping easier. They will want more animal care services and more specialized diets, they and will support pet businesses that cater to the needs of smaller animals. Teenage customers up to about 24 years of age are attracted to and will respond well to businesses that offer a wide variety of animals that can be kept as pet companions. A broad selection of the small and exotic pets along with their habitats, foods and specialty items will help attract these customers. Changes in pet owner lifestyles. The family dynamics of pet customers are also changing in a big way. According to 2014 Garden Trends Report, the traditional "mom role" is becoming more gender neutral, and men are taking on equal roles as the homemakers in many households. Men have always been a big part of pet keeping, but this means they're getting their hands into the hobby even more going forward. 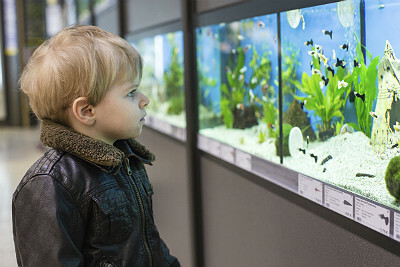 Men love to get physical and create with their hands, and what better way to do that than building a custom background for the aquarium, or making a maze to attach to the rat or guinea pig cage, or building an outdoor habitat for the tortoise. Positioning your store as a more "common sense" and "playground" creative will be a good strategy to help stimulate activities where dads can have fun and the kids can play. Cater to men with products that can enhance a hands-on point of view. All sorts of product areas can be expanded on that men will like. Offer selections of different-sized regular and uplift tubing; aquarium hinges, backs and cover materials for tops; hose reducers, plastic clams, aquarium silicone and acrylic adhesives. Provide lots of rocks, different types of woods and bark selections. Expand into outdoor feeders and waterers for birds and small animals, as well as specialized outdoor perimeter fencing for dogs. Provide seeds for catnip along with healthy herbs, or better yet, team up with a local garden store or nursery to provide pet friendly plants, shrubs and even trees. Changes in pet owner buying methods. People of all ages are moving toward the Internet. No matter what people want to buy, it is becoming common practice to search the Internet. Whether on a personal computer, a tablet or a smartphone, this practice is taking hold across all demographics. A study by Jack Loechner points to how customers are researching and buying products. In his article Accessing Affluencer's Influence, he discusses the values, preferences and behaviors of the three generations of millennials, Gen Xers, and baby boomers. From his research, Loechner cites that "although they share many commonalities, each generation also has unique needs. Millennials tend to respond well to messages with social benefits while boomers are interested in personal benefits." He also states that a "substantial percentage of millennial and Gen X affluencers access the Web regularly," citing smartphones, tablets, smart TVs and game consoles as important media devices. The popularity of smartphones is growing across all age groups, but is the norm for the youngest. They use their easily portable phone as a personal tool to find anything they are looking for, and then to ask their friends what they think about their discovery. Young people simply won’t be out and about without this tool, and they will use it to find whatever they are looking for. Clarice Brough has more than two decades of experience as an exotic animal professional — from owning an exotic pet store to breeding all sorts of exotic pet species. Today she is the website content and public relations manager for Animal-World.com, a website devoted to providing quality pet information. You can follow Clarice on the following social media sites: LinkedIn, Google Plus, Facebook and Twitter.